This Victorian property is generously proportioned and was nearly finished. It was actually featured in our previous nominations in The Northern Design Awards. The property is beautifully designed in a contemporary style whilst retaining all original features, like elaborate coving and fire places. There was just one room remained, left untouched since the previous owners. The property already has an informal lounge with a TV so this room was needed to be a more sophisticated space, with no TV, where guests and owns can relax socialising and listening to the music. The style had to be in keeping with the rest of the property, modern and un-fussy, in a neutral palette, providing the longevity to the design and flexibility in the future. All period features needed to be restored and the design had to blend the contemporary and the traditional elements with an air of sophisticated glamour. The most difficult part of the design was actually planning of the space and positioning the furniture in the room. Even though there is plenty of space, it is not symmetrical against the fire place. It was nearly impossible to place the sofas near the walls, creating a corner arrangement, as all the furniture was shifting to one side of the room, fire place was becoming less of a focal point and the ceiling light was not looking right neither in the centre of the room, nor nearer the sofas above the coffee table. 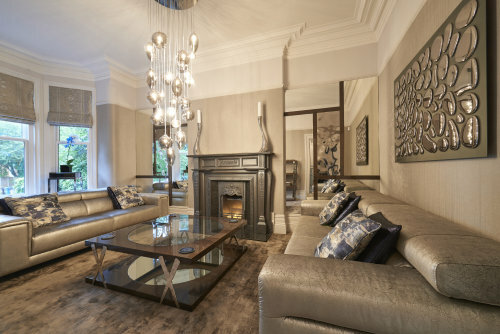 So the decision was made to "create" a centre of the room, that worked with the fire place and disregard the extended bay window area, making more of a decorative use of it. The original fire place was in a bad way, decorative wooden surround was damaged and it took a very experienced decorator a lot of time to repair it and paint it in a metallic colour which now makes the fire place look like it is cast iron. A team of fitters took all of the fire place out, restored and refitted all the parts with adding new granite slips on the sides and new hearth. All the efforts were worth it. Now it looks stunning. The same applies to the rest of the original features. Great care was taken in bringing them back to life. The overall design is contemporary and uncluttered. More emphasis was placed on the details and the finishes. The neutral palette is made more exciting by contrasting textures with modern metallic finishes. The textile wall covering from Today Interiors with a wonderful woven design provides a back ground with depth and light reflecting qualities. The sofas were made in Portugal by MAB and upholstered in a distressed leather looking fabric, soft to touch and with a metallic finish. These sofas have retractable head rests for extra comfort when needed, but do not block the magnificent window with high backs. Their exquisite chrome detailing around the arms of the sofas makes a world of difference. The coffee table and the side wall unit are from Spain and were hand crafted by Amboan. The chrome brackets of the furniture complement the high gloss finish and an unusually coloured wood veneer. Its colour matches perfectly with the Jacaranda carpet made in Tencil which has an intricate combination of looped and cut pile. The coffee table's glass top and mirrored bottom shelf reflect the spectacular light above. This light is hand made in a smoky mirrored glass by Concept Verre in France. It makes a statement and a talking point for after dinner entertaining. A matching table lamp is discreetly placed on the side wall unit, which was built out of modular pieces, perfect for this room. Another triumph is the alcoves, finished with mirrored panels. The frame work was made to order by Amboan in the same wood veneer with high gloss finish. In the middle of the alcoves I used ceramic tiles from Porcelanosa. Their rippled surface with mirrored finish works with the mirrors but breaks up the alcoves and the reflections of the room. The bay window was not forgotten and is housing display stands which for now have a couple of blue orchids matching the accent colours in the room. In the future, sculptures will be placed there, the search for those is ongoing, as the room has just been finished. What ever is displayed there in the future, it will look fabulous against the back drop of the Roman blinds made in a Sahco fabric with a textured design. The opposit wall is decorated with a hand made glass artwork from Ukraine. It looks like it belongs to the same family as the light. Overall, everything works in harmony with each other and the original structure of the room. Although there is an air of glamorous present in this room, it feels warm and welcoming. You can really relax in it and listed to the music!